Since we’re not doing a Streetfilm for this year’s CicLAvia, the Streetsblog team thought we would add to Sunday’s festivities by making the first ever Streetsblog photo scavenger hunt. The first person to tweet us a picture of each of the following items will win a Streetsblog t-shirt. To be clear, each person that tweets to @lastreetsblog the first item on the list wins a shirt, as does the first person to tweet @lastreetsblog the second item on the list and on and on. We’ll announce winners on Monday. 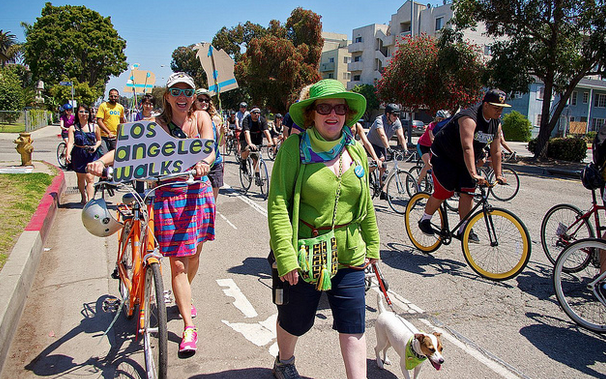 The pictures have to be taken on the CicLAvia route. Logos can appear on a shirt or somewhere else. You cannot draw the logo yourself and then take a picture of it. Remember, tweet your pictures to @lastreetsblog and we’ll announce winners, if there are any, on Monday. But most of all, have fun and be safe. Thwart Terrorism. Experience CicLAvia. Meet Your Neighbors.